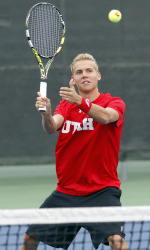 SALT LAKE CITY – The Utah men’s tennis team closed out its 11th-annual Utah Intercollegiate Saturday at Coach Mike’s Tennis Academy. Shane Monroe of BYU captured the singles Flight A championship title, while Utah State’s Shane Schneider netted the Flight B title. Cougars Francis Sargeant and David Ball walked away with the doubles title. Senior and second-seeded Cedric Willems was defeated by fourth-seeded Monroe, 6-0, 6-3, while junior Matt Cowley claimed third place. Freshman Santiago Sierra nabbed a victory over BYU’s Juan Canales, 6-3, 7-6(4) in the consolation bracket. Freshman Louis-Philippe Gascon captured third place when he downed Utah State’s Tomas Cosmai, 6-3, 6-4. In the consolation bracket, freshman Johan Jonhagen was defeated in the final round by Jeremy Bourgeois of BYU, 6-1, 7-5, while junior Justin Archer captured a win over Aggie Andrew Nakajima, 6-4, 2-6, 7-6(5). Willems and junior Jamey Swiggart were defeated in the doubles championship by BYU’s Sargeant and Ball, 8-4, while Cowley and Sierra claimed third place with an 8-3 victory over Schneider and Marcus Fritz of Utah State. In the consolation bracket, Gascon and Jonhagen lost to Aggies Jack Swindells and Karan Salawan, 8-0. The Utes return to action in Las Vegas, Oct. 15-19, at the ITA Regionals. This entry was posted in Schedule/Results and tagged Cedric Willems, Jamey Swiggart, Johan Jonhagen, Justin Archer, Louis-Philippe Gascon, Matt Cowley, Roeland Brateanu, Santiago Sierra, Utah Intercollegiate Tournament. Bookmark the permalink.